The annual Frank Loria Awards Banquet Monday was, once again, a hit thanks to the efforts of the Clarksburg Colombian Club and the Bridgeport Conference Center. Student-athletes from around the county were recognized for their efforts on the high school football field and walked away with plenty of hardware. That, in and of itself, is the norm. However, there was something a bit different about this most recent event. During the most recent event, some additional items were presented. And they were done in recognition of the banquet’s namesake and two other football greats from Harrison County. Prior to guest speaker Rick Trickett, Greater Bridgeport Convention & Visitors Bureau representatives Drew Pomeroy and Scott Duarte addressed the audience. The pair were there to present plaques of members of the West Virginia Sports Hall of Fame that were previously on display at the Charleston Civic Center. Frank Loria Jr. was presented with the plaque of his father, while Lincoln football coach Rob Hawkins and his wife Holly, who doubles as the assistant principal and athletic director at the school, were presented with the plaques for Joe Stydahar and John McKay. The plaques will be publicly displayed at Notre Dame High School in Clarksburg and at Lincoln’s Stydahar Football Field in Shinnston where the public can view them. So how did they end up at the Loria banquet Monday? Back in 2017, the Charleston Civic Center underwent a renovation and the plaques for the Hall of Fame that started in 1950 and at the CCC in 1960, needed a new home after half a century plus as the previous sites they were hung were replaced with glass. Not an issue for a few plaques, but there were nearly 200, according to Doug Huff, the executive secretary and treasurer of the West Virginia Sports Writers Association. With no space, the dilemma was to make sure they weren’t out of the public eye for long. However, building a facility to house, manage and operate to display the plaques wasn’t feasible. The decision was to regionally locate them. One of the landing spots was the Greater Bridgeport CVB. After sitting for more than a year, the decision was made to allow them to go to locations where they would be in regional homes with public access to be viewed as intended. While the Hawkins’ knew of the plaques, Duarte said the Loria family did not know about it. He said he talked with NDHS Athletic Director Steve Petitto who was thrilled with the idea of putting the plaque of Loria on display at their school. Duarte added that Notre Dame High School Principal Julie Frosch was “elated” about the plaque. He expects similar reactions as others are presented. The following are biographies on the three plaques presented, followed by the six remaining plaques. Frank Loria – His story is well known, first as an all-state athlete at Notre Dame High School in Clarksburg. Despite some calling him undersized, he became Virginia Tech’s first consensus All-American in football and from 1965 to 1967 the 5’7, 172-pound defensive standout started 31-straight games. Loria was an assistant coach at Marshall when the plane carrying the team crashed on Nov. 4, 1970, killing Loria and everyone on board. Joseph Stydahar – If the name sounds familiar, it’s because when teams play Lincoln in football they play the Cougars at home at Stydahar Field. He was a football and basketball standout at West Virginia University who later played for the Chicago Bears and coached for the Rams. Stydahar was a 1931 Shinnston High School graduate. John H. McKay – Known by many for his comedic media interviews on NFL Films while a coach with the Tampa Bay Buccaneers, McKay was highly successful as an athlete and as a coach. The former football and basketball standout at Shinnston High School, McKay coached the University of Southern California to four national championships. He also managed to take the expansion Tampa Bay squad to the NFC Title game in 1979. Archie Talley – One of the rare cases where the legend and reality mix. The long-shooting guard at then Salem College was the West Virginia Conference’s all-time leading scorer where he scored 3,720 points from 1972 through 1976 for an average of 32.9 points per game. Talley was the NAIA National Player of the Year and was drafted by the New York Knicks. Herbert Paul Barna – Although not as familiar a name, plenty of success from this Clarksburg resident. He had a prolific career in Major League Baseball that spanned 16 years where he played for several teams including the Boston Red Sox. He also was a three-sport standout – football, baseball and basketball – at West Virginia University. Clay B. Hite – Another familiar name as for years several Harrison County High School’s home venue for football games was Hite Field in Clarksburg. For 30 years – from 1921 to 1951 – Hite coached at Washington Irving High School. He also was a standout athlete at WVU from 1914 to 1919 where he was the quarterback on the 1919 squad and captained the 1916 basketball team. He helped build Hite Field, which was later named in his honor. T. Edward Davis – A resident of Lost Creek, many may be familiar with the name as it is the home gymnasium for basketball for what is now Salem International University. Incredibly, he served as an athlete, coach and administrator at the former Salem College for 50 years. He also helped form the recently defunct West Virginia Conference in 1925. Louis J. “Lou” Romano – A familiar name in Clarksburg circles, Romano was a successful player and coach at Glenville State College. However, it was at Charleston High School where he became a legend with some of the best boys basketball teams in state history. The Washington Irving graduate went 318-77 at Charleston High as a coach and he was gifted enough athletically to be a NAIA All-American. John M. “Brooms” Abramovic – He is considered Salem College basketball royalty and among the greatest ever to where the Green and White. And the numbers back that up. In 1942 and again in 1943 held led the nation in scoring and ended up becoming the first player in college basketball to record 2,000 points for his career. He also played professionally for two years. 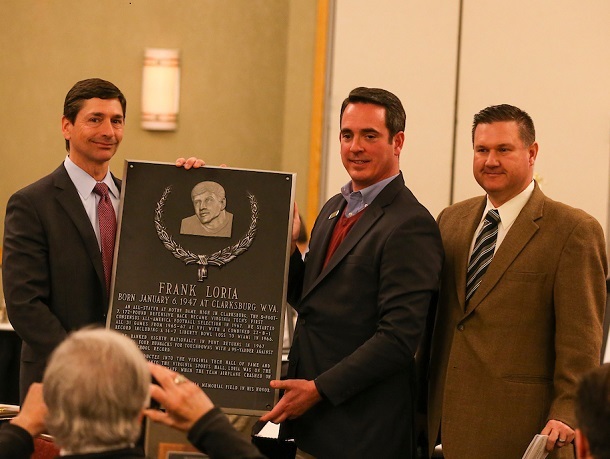 Editor's Note: Top photo shows Frank Loria Jr., left, with the plaque of his father presented to him by Scott Duarte, middle, and Drew Pomeroy. Bottom photo shows Lincoln football Coach Rob Hawkins with his wife, Principal and Athletic Director Holly Hawkins with the plaques of Joe Stydahar and John McKay. Photos by www.benqueenphotography.com.